This Luxury Highlands NC home for sale on Lake Ravenel is located at 39 Crescent Trail. This stunning home offers 350 feet of water frontage and is in the Cullasaja Club. The lake setting cannot be beat, a perfect spot for canoeing, paddle boarding, kayaking, or fishing. The setting for this home cannot be beat, including gardens and trails, water features, a gazebo, and a dock. 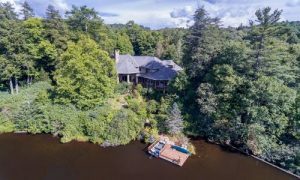 If you have been looking for a luxury mountain retreat in Highlands NC this property must be on your list! This luxury Highlands NC home for sale has 6 bedrooms and 6.5 baths on a lot that is 1.65 acres in size. Captivating views are captured throughout the home. 39 Crescent Trail is ideal for families and entertaining. The living room boats a soaring ceiling, two stories in height, as well as a floor to ceiling native stone fireplace. Here you will also find a wall of glass which opens the room to the spacious covered deck. Heart of pine floorboards throughout give this home an open, relaxed feel that is incredibly welcoming. From the beautifully appointed kitchen and the cozy den to the luxurious master suite complete with a private outdoor deck no detail has been overlooked in this Highlands NC home. There is a convenient office lined with bookcases and a comfortable daybed for enjoying a good book or catching a quick nap. Upstairs the three en suite bedrooms with private balconies are ideal for guests. The large covered wraparound deck embraces the setting and is complete with a stone fireplace. This private luxury retreat is designed to embrace both the indoors and the outdoors. Contact our team at Berkshire Hathaway HomeServices Meadows Mountain Realty today to learn more about buying Highlands NC real estate. We welcome the opportunity to schedule a private showing of 39 Crescent Trail, helping you conduct a successful property search. Let our knowledge and experience serve as your guide, helping you locate the ideal luxury Highlands NC home for sale for you and your family.